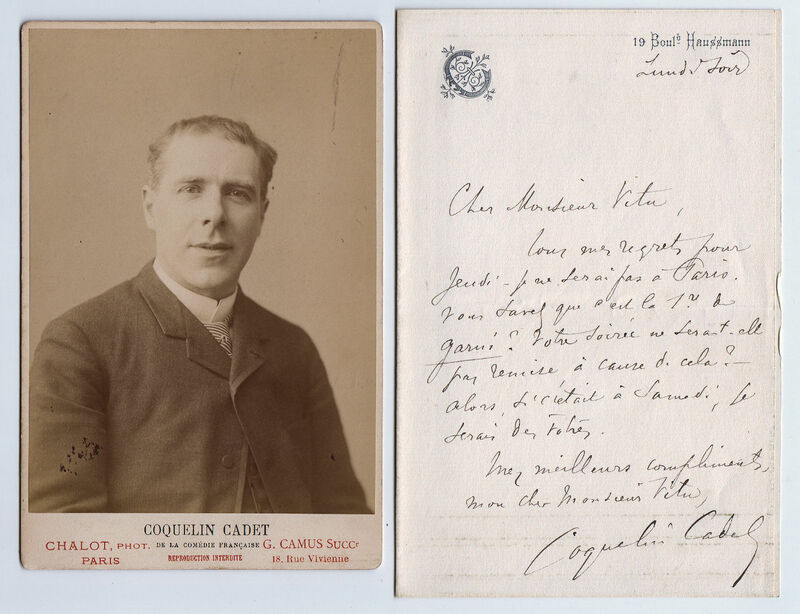 Autograph Letter Signed, to Monsieur Vitu, about their arrangements to meet. In French. A good one page example, with a separate cabinet photographic portrait of Coquelin, by Chalot. Paris, undated. Ernest Alexandre Honoré Coquelin (1848 – 1909), French actor. Also called Coquelin cadet, to distinguish him from his brother, he was born at Boulogne, and entered the Conservatoire in 1864. He played a great many parts, in both the classic and the modern repertoire, and also had much success in reciting monologues of his own composition. He wrote Le Livre des convalescents (1880), Le Monologue moderne (1881), Fairiboles (1882), Le Rire (1887), Pirouettes (1888).